Hi guys! My apologies for posting so little lately! I'm so busy with school at the moment, that I haven't been able to work on my next challenge yet. So instead I'll show you this second, slightly different version of my "divergence" mani, that I made some time ago. The basecolor I used is H&M Deep Deep Water. It's such a simple yet pretty color, and the fact that it covers in one coat makes it even better! On top I made the red part with Essence Wild Thing (an oldie! ), and the turquoise tips with Essence Bella. As usually tape was my little helper for those clean edges. ;-) Thanks for stopping by and I hope to see you again soon! This is lovely! That essence bella color is GORGEOUS. Girl, how do you clean up your nails so well for pictures? I don't get my nails very messy when painting but I seem to be unable to paint a perfect lower curve by the nail bed. Hmm, perhaps I need to do a swipe with some acetone? 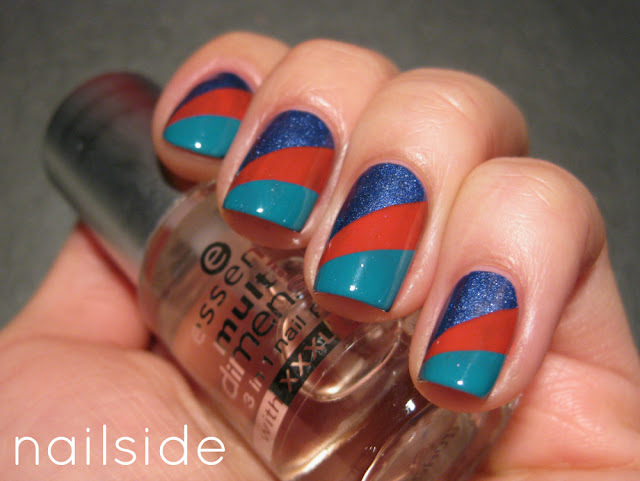 I DIGRESS - beautiful manicure - loving your blog! Wow I love this design! Makes me think of summer, like a nautical theme! I love how your manis are always so perfectly even. 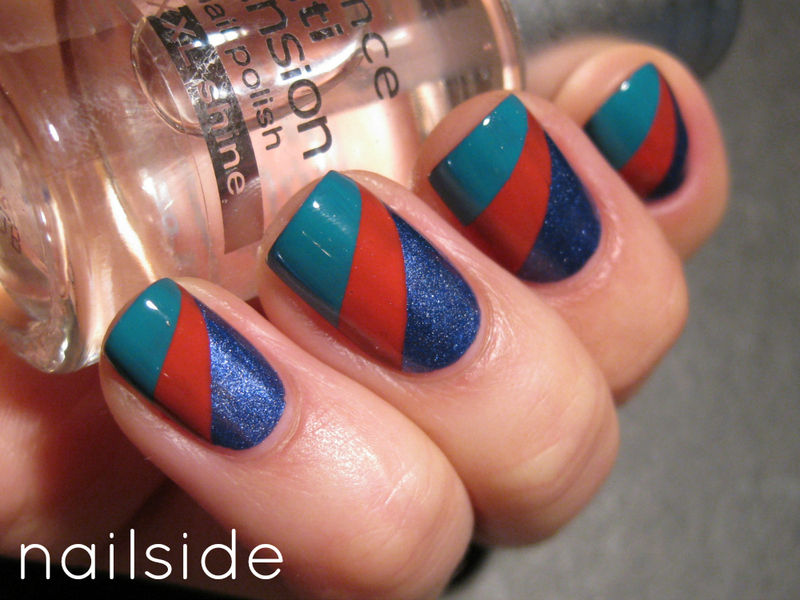 If I tried this, the lines would be all wonky and not the same on each finger. LOL. This is great--I love the colours together! cool color combination! I wouldn't have come up with it and I like it! Wow, those colours look amazing together! It looks rly good :) Colours are beautiful! Tape rules my nail art world too! Always clean and so pretty. I loved your first divergence so much. And this one is just as fantastic. Great job! You're so inspiring. gorgeous! this turned out so perfect! Your finish looks so clean! I love these! They are such pretty colours, I think they'd look great in the summer. I also did a nail art tutorial with sticky tape on my blog, I think you may like it. Continue posting amazing nail art tutorials!